Let your your big birthday event become an unforgettable event under the sea with Spongebob Party Supplies like tableware items, fun favors, and big decorations! You can get packs of decorating supplies including napkins, plates, cups, banners, table covers, cake toppers, and more, as well as thank you notes and invitations, personalized items, jars and bins, balloons, and lots more! I’m ready, I’m ready, I’m ready…. SpongeBob is ready for your next birthday party extravaganza! 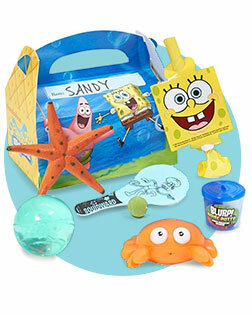 Bring Bikini Bottom to life when you deck out your home with SpongeBob party supplies. The most popular sea creature there is, this sponge is the perfect party companion for your little one and group of friends. Join SpongeBob, Patrick, Sandy, Mr. Krabs, Plankton and the rest of the gang for some sandy beach birthday fun. C’mon, we know you want to catch jellyfish and blow bubbles just like your favorite under-the-sea characters. Everyone has a favorite quote from SpongeBob. For a fun party game, have everyone write down their favorite quote then read them out loud. The kids will have a blast trying to guess which character said each quote! Pressed for time? Running out of ideas? It's Birthday Express Ideas & Inspiration blog to the rescue. Get inspired and excited to throw a party your kids could only imagine before. Get creative and find helpful tips on themes, trends and DIY party ideas. Who wouldn’t come to a party when SpongeBob is the one to personally invite them? 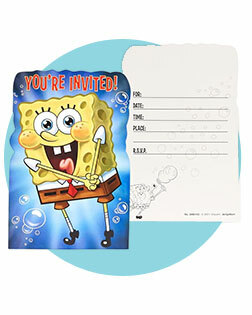 Your guests will take one look at these SpongeBob invitations and be ready to have a good time in Bikini Bottom. With separate lines for date, time, place and R.S.V.P, your child will be able to write these invitations all by himself! Yellow is the magic color at this sea-themed birthday party, and it’s not a party without plenty of decorations. You won’t be able to get enough of the fun-loving sea creatures of Bikini Bottom, so place them throughout the party area. The kids will feel like their favorite characters are actually there to celebrate along with them. From balloons to table decorations and tableware, you’ll find everything you need to make your party area truly feel like Bikini Bottom. The party can’t start until SpongeBob himself is in the room! Add this shiny foil balloon to an entire bouquet of balloons, or tie this to the special guest of honor’s chair. Printed on both sides, you’ll be able to see SpongeBob’s signature smile from every angle. 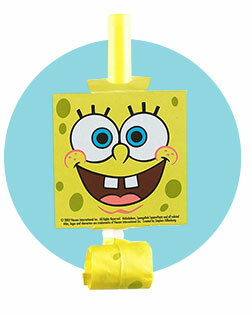 Keep every birthday guest at the table entertained with this SpongeBob decorating kit. SpongeBob and Patrick sit front and center surrounded by shiny blue fringe as the rest of the characters float around in confetti form. SpongeBob, Patrick and friends are hungry for cake and ice cream. 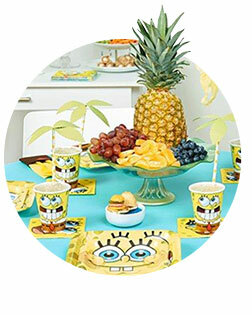 Keep up the Bikini Bottom theme with SpongeBob cups, plates, plastic ware and napkins. While the kids enjoy cake, ice cream and other snacks, they’ll love hanging out and joking about their favorite SpongeBob episodes. SpongeBob is always into something new, so he would never stand for a boring party! Liven up your group of guests with the best in games and activities. You’ll never run out of things to do when you have a Piñata, paddle ball game, photo shoot and costumes! SpongeBob would never go anywhere without his trusty group of friends, so make sure the gang is all there for a whale of a good time. The underwater fun doesn’t stop with decorations, so you need to bring some action to your party, too. The kids will love trying to reach these goodies once SpongeBob sets them free. Don’t forget the blinbfold! Set the scene for jellyfish catching and create a lively photo shoot with this scene setter decoration kit. The kids will feel like SpongeBob, Patrick and Sandy are right there with them saying, “Happy birthday!” As an added bonus, you can use these scene setter both indoors and out. SpongeBob is all about sharing the fun. He wants to make sure everyone continues to have a great time, even after the party’s over! Choose from a variety of Bikini Bottom and Sponge Bob themed party favors for your guests to bring home, and the special times will last a lifetime. Filled favor boxes are a great way to make sure everyone gets a take-home party treat while stickers, tattoos and blowouts are great add-ons to take-home treat bags. Before you say goodbye to your guests, make sure they have something to always remind them of the great times they've shared. When they get home, they'll take out this treat box and relive the memories! You can even write each guest's name on the outside of the boxes. Keep the kids from fidgeting with these tiny toys. Featuring SpongeBob’s happy face, these blowouts will provide hours of entertainment. Including eight assorted blowouts and eight themed medallions, you’ll have enough to keep all of your guests smiling.